I was asked by People.co.uk to compare Aston Villa to a cartoon character. I suggested Spongebob Squarepants, as he’s young, full of energy, but ultimately not very good at football. I was wrong. They didn’t have much energy. In the Welshman’s absence, Jack has really stepped up. Many will point to the fact he’s getting a run in his preferred position, but I also think he’s relishing the added responsibility. Whenever he praised Ramsey’s heroics earlier this season, I always felt he was masking a nagging envy. There was a lot of, “he’s a great example” and “I hope I can follow what he’s doing”, but the subtext was clear: Wilshere wanted a bit of the glory. Now, finally, he’s getting it. Prior to the kickoff of the 2013/14 campaign, Wilshere had just five Arsenal goals to his name. 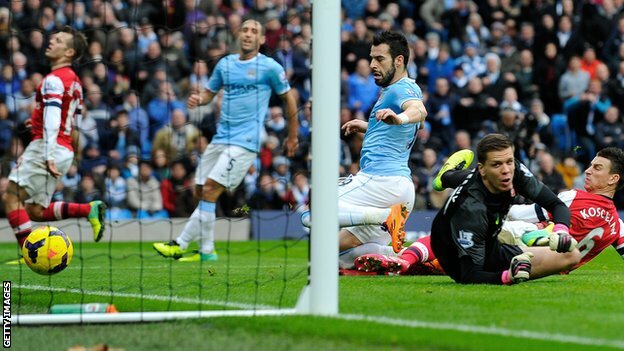 However, the goal he scored against Villa was his fifth of this season. You don’t need to be a mathematician to work out what that means, but I’m going to tell you anyway. In just half a season, Wilshere has doubled his career goals tally for Arsenal. Ramsey’s extraordinary feats have clouded Wilshere’s improving efficiency. The fact that moments after scoring his goal he won the ball back and created the second tells you everything about his character. Many players would have been content to sit back and soak up the glory for a bit. Not Jack: he was straight back on the front foot. That competitive spirit is invaluable. His job is to defend, and he clearly adores it. For too long Arsenal had defenders who aspired to be footballers. Mertesacker, on the other hand, has embraced his fate. He’s under no illusions: he couldn’t be a No. 10. With his physical and technical limitations, centre-back is the only position in which he could realistically make a career as a professional footballer. Almost because of that, he is absolutely dedicated to his craft. Unlike the likes of Ozil, he can’t get by simply on talent. He is a student of the game. Scrap that: he’s a professor. A don. His reaction to conceding the Benteke goal was fabulous. He was furious with Santi Cazorla for ceding possession in such a needless manner. We saw a flash of the rage that Mertesacker turned on Ozil when he failed to applaud the away fans a few weeks back. Behind the meek exterior is the same competitive spirit that drives Wilshere. …largely due to his clearly disappointed response. There’s a few things to say on this. The first is that it’s entirely reasonable and normal for a player to be disappointed at not being used. The second is that Arsene probably made the right choice: when you’re holding on to a lead, Oxlade-Chamberlain’s energy is certainly more useful than Podolski’s powerful shooting. However, the noise surrounding Podolski’s uncertain future has not been generated by one isolated incident. It’s been clear since the start of 2013 that Arsene Wenger has issues with selecting the German. The fact that teenager Serge Gnabry was selected to start over Podolski seems far more significant than the fact he didn’t make it off the bench. As a man with more than 100 caps to his name, Podolski wouldn’t be human if he wasn’t a little irked to have fallen behind the upstart Gnabry in the pecking order. Arsene has thrown down quite the gauntlet to Podolski here. As I wrote in this piece for ESPN, I fear it could end acrimoniously in the summer. However, perhaps it’s the mother of all motivation techniques. If Podolski is handed an opportunity from the start against Fulham, he’ll certainly feel he has a point to prove. It wasn’t professional. It was sloppy. Arsenal should have had this game wrapped up, but instead slacked off in the second half and allowed Villa back in to it. Given how poor Villa were for most of the game, anything other than three points would have been something of a disaster. However, we got there in the end. We stumbled but we didn’t slip. Arsenal are back on top of the table. Just how I like it. …and not just because over the overcast sky that shrouded the ground in a wash of grey. Arsenal’s first-half performance was poor. Both the crowd and the team were subdued. At its best, the relationship between those two entities is one of mutual provocation, each spurring the other on. On this occasion, neither side did much to elucidate a response from the other. The fans were probably hungover, and the players plain tired. I love the festive period but when you look at the number of muscular injuries being picked up across the league, fatigue is clearly a problem. Arsenal were awarded a free-kick in a dangerous position just outside the penalty area, and Sagna was somehow given permission to take it. Unfortunately, his curled strike hit the wall. On the serious side, one has to wonder how on Earth that came to pass in a team also containing Santi Cazorla, Mikel Arteta, Lukas Podolski and Theo Walcott. I suppose one could make the argument that as a player who crosses regularly, Sagna is well practised at putting curl and dip on the ball. However, Cazorla and Arteta were first-choice set-piece takers at Malaga and Everton respectively. Surely the Arsenal dead-ball jinx can not have struck them so severely that they have now been superseded by Sagna? In the absence of Mesut Ozil and Aaron Ramsey, Wilshere was handed the No. 10 role. He flourished. This performance was reminiscent of the all-action display he gave against Swansea in last season’s FA Cup. On that occasion, it was universally declared that Wilshere was “back”. That turned out to be a little hasty, so I’ll refrain from such proclamations today. This performance was simply another reminder of Wilshere’s undoubted talent. The assist for Walcott’s goal was, in particular, sublime. However, there have been plenty of such reminders this season. One immediately thinks of Wilshere’s glorious goal against Norwich, or his curled effort against Marseille. His problem is not talent. His problem is consistency. One hopes that time and regular football will enable him to overcome that troublesome hurdle. I was one of those who was hopeful that Podolski could provide cover for Olivier Giroud at centre-forward. On the evidence of this game, that isn’t going to be the case. Podolski and Giroud are very different types of striker. They require different types of service, and a different style of approach play. Podolski is an instinctive finisher who comes alive in and around the penalty area. Giroud is a tireless target man, who is prepared to run in to the channels and play with his back to goal. For Podolski to thrive as a centre-forward, Arsenal would need to adapt their game. Judging by today’s performance, we’re in no hurry to do that. It could be successful. Both Liverpool and Chelsea play without what you would call a traditional ‘target man’. Chelsea are a great example: like Arsenal, they play with three diminutive attack midfielders. However, they do not require a hulking great striker in order for those players to function. They regularly field the nippy Samuel Eto’o or the slight Fernando Torres. The player with the most obvious similarities to Giroud, Demba Ba, barely gets a look-in. The powerful Romelu Lukaku was sent out on loan. However, Arsenal appear to have forgotten how to play without a traditional no. 9. It’s odd, especially when you consider that for so many years Arsene Wenger was criticised for his refusal to deploy a conventional striker. The Invincibles team of 2003-04 arguably pioneered the whole “false nine” thing before anyone even knew what it was. With Thierry Henry drifting out to the left, and Dennis Bergkamp dropping in to midfield, Arsenal’s varied goal threat came with stealth and surprise. SKY lazily labelled it a 4-4-2 and we all bought it, but in truth there was no central pivotal striker. In recent years, that has changed. Arsene Wenger, the man who signed Mark Hateley for Monaco, has renewed his love affair with the powerful centre-forward. Emmanuel Adebayor, Marouane Chamakh and most recently Giroud have heralded a return to playing with a more traditional type of striker. And now, Arsenal have become dependent on it. We’ve been blessed to have Giroud fit and firing for most of this season and last, but it’s also made us strategically lazy. With Podolski starting up top, the rest of the team didn’t seem to know how to play it. Nicklas Bendtner’s introduction changed the game not because he is a better player than Lukas Podolski, but because he is a better impersonator of Olivier Giroud. With Bendtner now injured, Wenger may be a little more likely to dip in to the market. If he does, it must be for a striker with similar attributes to Giroud. This current Arsenal team look unsuited to playing with any other kind of striker. Someone with a different style would require a period of adaptation, and given the intensity of this title race I’m not sure that’s something we can afford. Diego Costa would be ideal, but the chances of him leaving Athletico Madrid in pre-season are slim. Many will baulk at the suggestion, but Arsene Wenger needs to find another Emmanuel Adebayor. In January (yes, January) of 2006, Arsene Wenger plucked the little-known Adebayor from the subs bench at Monaco. He went on to become a 30 goal, £25m striker. It’s time to ask Arsene to pull another such rabbit from his extraordinary hat. When Emmanuel Adebayor was being left out of the Tottenham squad week-on-week by Andre Villas Boas, I privately wondered if Arsene Wenger would ever consider a short-term move for the former Arsenal man. Note: privately – I knew such a suggestion would invite ridicule and abuse if made public. It’s off the table now, and would probably have never happened: Adebayor simply carries too much baggage. However, there’s no doubt that physically and technically, he has all the attributes we require. Arsenal need someone with size, strength, good close control, and ideally a bit of speed. Someone who can play the Giroud role, but perhaps with their own unique spin. An extra trick, or yard of pace. Over to you, Arsene. Surprise me. 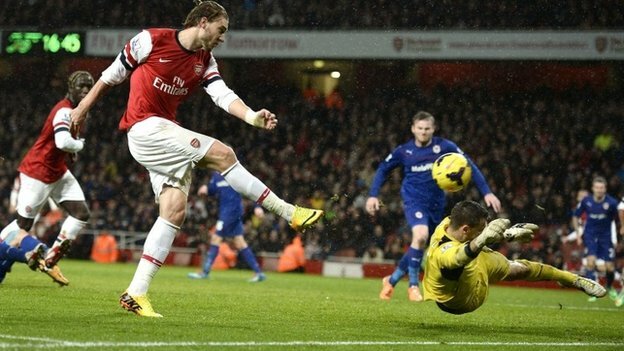 Introducing Rosicky and Bendtner was effectively an admission of the issues with the initial team. Fielding both Flamini and Arteta was unnnecessarily cautious, whilst Podolski’s problems have been covered above. As soon as the pair came on, Arsenal looked more effective. Walcott occasionally takes stick for shirking responsibility, but I thought he really took this game by the scruff of the neck. His crossing was quite superb, and Per Mertesacker probably ought to have scored from two of his most enticing balls. According to Squawka, he created six goalscoring opportunities against Cardiff – his highest tally in any game thus far. He also has six goals this season, from just 10 starts. Wingers, by their nature, are a bit infuriating to watch. They deal in fine margins – quite literally, given their proximity to the touchline. Considering that, Walcott’s efficiency and continued productivity is quite remarkable. Everyone loves a redemptive hero, and there’s no doubt that his could be a hugely significant goal in our title bid. It’s unfortunate that he was injured in scoring, but I suspect his ego might have enjoyed the pseudo-martyrdom of sacrificing himself for the good of the team. Rather enjoyably, he has now scored more goals from open play in this season’s Premier League than Tottenham’s £26m man Roberto Soldado. …and a mouth-watering game against Tim Sherwood’s Tottenham. With a tricky tie against Bayern in the Champions League, the FA Cup now represents our second-best chance of a trophy in 2013/14. Maybe the best. The season we’re having deserves silverware. We ought to give this competition absolute focus. …was an intriguing comparison. In the first half particularly, Lewandowski was imperious. His hold-up play is immaculate. Giroud’s performance was a little more uncouth, but just as effective. Robbed of the service Lewandowski received, Giroud made his own luck, working the channels tirelessly. Arsenal have been linked with Lewandowski, but for my money he’s too similar to Giroud to be ideal. Arsenal would be better served signing someone who provides an alternative rather than a replica. Plus, Lewandowski is obviously off to Bayern. The elbow Lewandowski swung at Koscielny was certainly reckless. However, according to the laws of the game, a yellow card is the appropriate response for “reckless” behaviour. It is violence or the use of excessive force that warrants a straight red. Lewandoski’s elbow looked to be dangerous but not deliberate. A yellow seemed about right. Anyone hoping that his switch to the right and fabulous goal against Norwich might provoke an immediate upturn in his form will have been sorely disappointed. According to the official UEFA stat-pack handed at the end of the game, Wilshere completed just 15 of 30 attempted passes – a shockingly poor 50%. By comparison, his replacement Santi Cazorla managed to complete 90% of his passes in his 30 minutes on the field. There are two ways of interpreting those figures. The first and most lenient reading is that Wilshere was on the field during Arsenal’s poorest spell, hence the skewed numbers. He wasn’t the only player guilty of poor passing in the first half, and Cazorla may have benefited from facing a tiring Dortmund. The alternative inference is that Wilshere directly contributed to Arsenal’s first half struggles, and that the introduction of Cazorla was actually the catalyst for Arsenal’s improvement. …until the last 20 minutes. After an anonymous first-half, he spent the second half drifting from flank to flank looking for space. Eventually he found some joy on the right-hand side, and almost created a spectacular goal for Santi Cazorla, who was denied by the crossbar. After last season’s home defeat to Swansea, Wenger told the assembled press conference: “If you can’t win the game, don’t lose it”. He will have been disappointed to be forced to repeat the mantra in the wake of this defeat. Arsenal sensed their growing superiority against a tiring Dortmund and went for the jugular. Unfortunately, the Germans countered with a classic sucker punch. Arsenal are in the unenviable position of requiring a favour from Marseille to avoid having to win at either Dortmund of Napoli. Given the French side have thus far failed to pick up a point, that seems unlikely. Unfortunately, Marseille are so far adrift at the bottom of the group that if Arsenal fail to qualify they will more than likely drop in to the energy-sapping Europa League. That, for me, is the worst case scenario. In Dortmund, Arsenal lost to a side that is better than any they will come up against in the Premier League. What’s more, we were unlucky to lose. This is a bump in the road rather than the end of it.